When journalist Cynthia Bonsant is looking into the death of a teenager, it leads her down a path to information regarding spikes in deaths related to users of an online App named Freemee. What she learns is that Freemee is a lifestyle App that encourages users to mine their own data. Rewarding them for this, whilst all the time suggesting tweaks and adjustments to the user’s lifestyle to become more popular and successful. Railing against the likes of Freemee and other data collectors is ‘Zero’, a collective of anti-data collection activists in the style of ‘Anonymous’. As Cynthia starts digging into ‘Zero’ and Freemee, people start dying and she is pursued by shadowy figures who have made it their aim to stop her by any means necessary. The author has taken care to ensure that the technology talked about) and there’s a fair bit of ‘tekkie talk’), is already in existence. What he has very cleverly done, is then ramp up the possibilities of what these companies do with our data and how they then use that to influence our actions. We see a world where freedom of choice is becoming ever rarer, as these data controllers use the information supplied to them to channel users down the paths they’re directed. This is a world where choosing your next Prime Minister/President may not be a choice, but a foregone conclusion. This is no massive leap of imagination, the world in this book is just a hop, skip and a jump away, which makes it all the more real and frightening. What will Cynthia’s investigation unearth? Who is behind Freemee? Who can Cynthia trust? 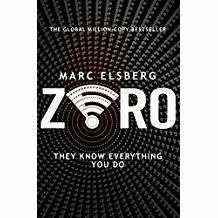 Zero is a captivating read and a very well-researched techno-thriller that is a prescient as it is scary.